Crammed full of materials designed to enable the GC to devise challenging and interesting organisations, and ideas for campaigns including setting the characters up as the villains! Publisher's blurb: "This essential Spycraft GC aid presents hundreds of new campaign options, from new ways to expand your basic criminal organizations to devious plots they can unleash upon the agents. 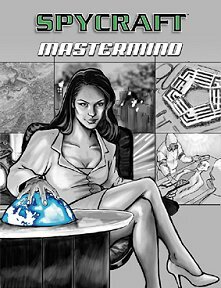 This definitive volume not only expands upon existing GC options but pushes the limits of the Spycraft system with all-new game and design options."